and amenities but their most surprising feature is called BosaVolt. 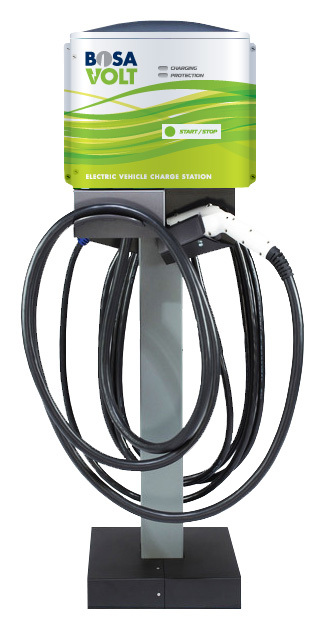 This modern ad-on allows for those with electric cars to have their very own charging station/hook in their parking stall in the underground parkade. Click here to read more about this new feature on Bosa's website. been obsessed with in recent years. "Green" living has become a highly marketable and popular selling feature in the Vancouver condo marketplace as well as throughout many other cities in North America and the world. The question that has come up in recent years is whether these "Green" features offered in Vancouver condos will add to resale value in coming years. In other words, will people only look to purchase "Green" Vancouver condos thus driving the prices and salability of buildings with out-of-date infrastructure downward. So far most buyers do not buy exclusively "Green"condos however a feature such as BosaVolt may in fact hold significant value to buyers in the future. The reality is that electric cars have been around for nearly 200 years. In modern times the electric car saw brief popularity in the mid-1970’s. Many of you may remember the Vanguard-Sebring’s Citicar (check it out here). Due to the oil/energy crisis of the 1970’s Vanguard-Sebring became one of the largest car manufactures overnight, however this success was short lived. Unlike the mid-1970’s, this modern electric car wave is here to stay. The question is how long until electric cars are mainstream in terms of holding a large share of the car market. When this occurs there will be a great value in a feature such as BosaVolt. How great the value add in the Vancouver condo market will largely depend on the cost to retrofit an entire building with this feature. I anticipate that this will not be cheap so those with a BosaVolt hook up willl hold a significant advantage in the market place. For now it is a unique feature for a select few, but may hold significant value in time.